At a time when most coal-fired power plants are using less mercury — which causes brain and kidney damage — the coal plants that line the Ohio River in southeastern Ohio have gone against the grain by doubling their toxic mercury outputs, according to the Columbus Dispatch. The best part is that AEP reps aren’t really fazed by this, as they basically just shrugged their shoulders and said they buy cheap coal, and sometimes it’s really full of mercury. Oops. Aside from the gross lack of accountability or real concern about the fact that three of their power plants made a list of the power plants that emitted the most pollution in 2008, I enjoy that their main retort is that new scrubbers are going to fix this problem. I hope these aren’t the same scrubbers that the Gavin plant installed in 2002, because with the scrubbers, it ranked 12th in worst pollution — in fact, Gavin’s pollution actually increased from 2007 to 2008. I also hope the Gavin scrubbers aren’t the advanced scrubbers that they claimed counted as “advanced technology” when they applied for a $30 million loan from advanced-energy project funds in February 2009. I explained why it was lame back then, and it’s still counter-productive to think scrubbers are the future of advanced energy. This is why people need to reduce their energy use, why we need to focus on energy efficiency in policy and products, and why we need to start supplementing renewable energy for at least some coal use. If in just one year a power plant can double its mercury emissions, imagine what the air, the water and the fish from rivers and lakes are going to be like in another year, or in five years. Too bad we never hear of the opposite happening in one year — it would be pretty great if power plants were as good at decreasing their pollution as they are at increasing it. Same with people. I love, love, LOVE this article from Grist’s David Roberts. The message? Changing behavior is as important as changing technology. This article is great because when it comes to energy efficiency, everyone focuses on which type of new technology will be the most efficient, but people rarely mention reducing energy use in the first place. How much does that same ton of CO2 abatement cost using these behavioral programs? -$165. No, that’s not a typo. It’s a negative sign. As in: $165 worth of profit per ton of carbon pollution reduced. If similar programs were expanded nationwide, Allcott and Mullainathan estimate a net value — savings minus costs — of $2,220,000,000 a year. Of course much research and testing remains to be done before it’s clear whether these programs perform equally well at scale, but as a first approximation, that’s not too shabby. I highly suggest reading the article — the bar graph (complete with smiley faces) for utility bills, which on average leads to a 2 percent drop in energy use, really shows how simple messages can have a meaningful and positive impact on people, their behavior, and energy use as a whole. Until humans all become robots, there are some things technology just can’t do, like teach and encourage people to change their behavior. Best not to wait for scientists to invent a robot that follows you around your house, turning off the lights and unplugging unused appliances and gadgets. 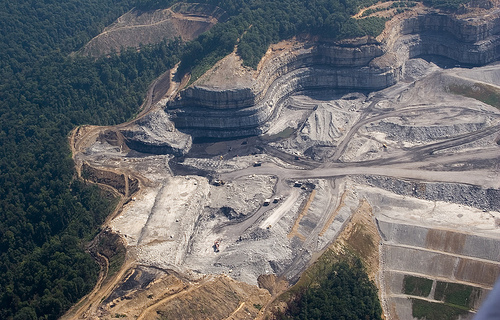 Mountaintop removal mining is a dangerous activity that I feel very passionate about ending. I think it’s a mix of going to college near Appalachia, an interest in toxicity and writing my senior research paper about female activists in this arena whose stories really touched me. It’s a horrible way to get coal out of the earth, both for people and the environment. Mountaintop removal mining is the process of trying to get to coal seams by blowing the tops of mountains with explosives. Typically, one might think of the coal carts and underground mines when imagining coal extraction, but this new process is sweeping through Appalachia and taking countless mountaintops with it. This picture, from www.ilovemountains.org, illustrates just the visible damage done to the mountain. Trees and wildlife destroyed, as are the benefits that come from those trees and wildlife — e.g. flood prevention, food, habitat. Plus, the explosives used catapult toxic debris into nearby streams, ponds and lakes, which contaminates the water that people drink and the water that many animals drink or use as a habitat. It’s not uncommon for water tainted by the debris from blasting to come out of the faucet orange instead of clear. It’s also common for valleys to be filled with rubble from blasting, which leads to rainwater being mixed with the chemicals from these rocks and seeping into streams. Mountaintop removal mining has also been associated with respiratory problems for people who live near these sites, as they inhale the fumes and the ash created by blasting. Stomach problems are also common — not surprising considering the water near these sites is likely contaminated with toxic chemicals. People who live near these sites are often very torn, because it’s not as easy as picking up and moving elsewhere. Their households are often their only assets, their households are often in the family or even were built by a family member, and Appalachia is poverty-stricken and people don’t necessarily have the money to pick up and start a new life elsewhere. Even selling their house would be impossible — I mean, would you buy a house where the water was orange and the foundation was cracked and flooding from MTR? Like many solids extracted from the earth, coal must be washed to separate the coal itself from the rock attached to it. Washing the coal leaves a watery sludge mixture, which is usually just put in some kind of sludge impoundment similar to a lake or pond — and people must cross their fingers and hope the impoundment stays put so they aren’t flooded with slurry. 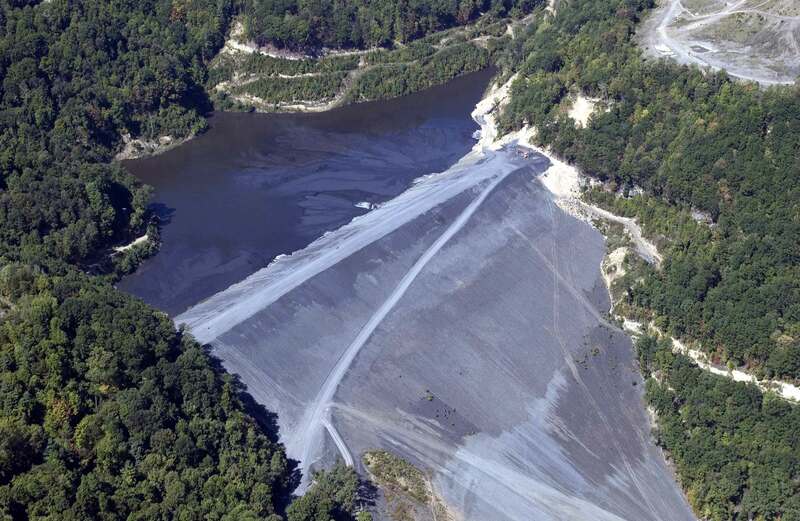 In December 2008, coal sludge flood actually happened in Tennessee — a retention pond burst and more than 500 gallons of coal slurry flooded a city in Tennessee, leaving the city flooded with a sludge that contained toxic chemicals like mercury, arsenic and lead. This kind of disaster is the result of trying to just put toxic waste in a fenced-in area and ignoring the fact that it is toxic and needed proper disposoal (or, if there wasn’t such a thing, it shouldn’t have been created in the first place if it couldn’t be disposed of safely). The government continues to permit MTR mining even though it poses dangerous and well-known threats to the environment and to the people who live near these MTR sites. Advocates of MTR mining say it creates jobs, when in reality it is a much more mechanized form of mining that uses machines more than manpower, and has cost many Appalachians their jobs in underground mining. MTR mining completely disregards the environment and the health of the people who live near these mountains in order to feed our country’s “need” for coal, and we need to realize the effects that our habits can have on the people who suffer because we demand more and more energy and electricity. Coal River Mountain Watch’s Coal River Wind Project is a great solution to the problem of MTR mining because it suggests harvesting a renewable energy resource (wind) in the mountaintops instead of blowing them to pieces. It creates jobs, protects health and keeps energy flowing. Visit the Web site to support the cause. You can visit countless Web sites to support the end of mountaintop removal mining, and ilovemountains.org is a good place to start. Contact your representatives and let them know how you feel about MTR mining, and visit this EPA site to find out how clean your electricity is. Simply reducing your overall energy use can reduce the demand and the act of MTR mining, as can supporting alternative, cleaner, renewable energy sources through your senators, representatives, activism and donations.